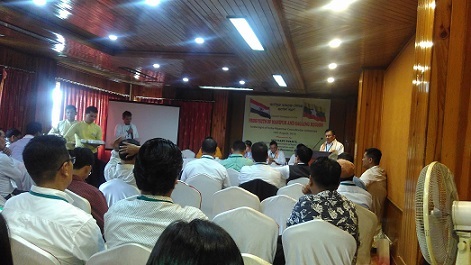 A citizens’ dialogue on the ‘Prospects of Manipur and Sagaing Region’, in the light of the India-Myanmar cross-border initiatives was held under the aegis of the Act East Policy Committee, Government of Manipur (India) in association with the Indo-Myanmar Fraternal Alliance here on Sunday. Titular king Leisemba Sanajaoba, King of Manipur and president, All Manipur Working Journalists’ Union, Brozendro Ningomba attended the inaugural function of the citizens’ dialogue as the Chief Guest and Guest of Honour respectively. Speaking on the occasion, titular king Leisemba Sanajaoba appealed to shun bandh and blockade to to avail the opportunities of Indo-Myanmar cross-border and focus on development. “Bandh and blockade only bring hindrance to development of the State,” said titular king Leisemba Sanajaoba. Appreciating the Government under Manipur Chief Minister N Biren Singh and the Act East Policy Committee’s contribution in opening the international entry-exit checkpoint at Moreh-Tamu border on August 8, he expressed that he would urge the CM for construction of one Buddhist Guest House at Imphal for taking a sojourn by the Myanmar Buddhists who are going to Bodha Gaya in Bihar. Convenor RK Shivachandra Singh of Act East Policy Committee, Government of Manipur, expressed the need to develop the underdeveloped regions of Saigang division of Myanmar and Manipur in India’s Northeast in this era while the Director of Information and Public Relations, Heisnam Balkrisna Singh gave welcome address of the occasion. After the inaugural function of the citizens’ dialogue, there were three technical sessions. In the day’s first technical session on Academia Interface and Prospects of Collaborations, Tourism Director W Ibohal; Mizzima Foundation chairman Soe Mynt, Executive Director of Fly Mya Company and Dr Elangbam Bijoy, Professor, Manipur University shared their views as resource persons. Myanmar delegation leader former secretary Myat Kyaw Kyaw of Saigang region also spoke in one of the technical sessions. Other delegates from Myanmar who were present at the dialogue are Managing Director Soe Myint of Mizzima media group and Nyan Tun Lin, a close aid of Saigang Chief Minister. Entrepreneurs from both inside and outside the State participated in the programme. The citizens’ dialogue will continue till Monday at Sendra.